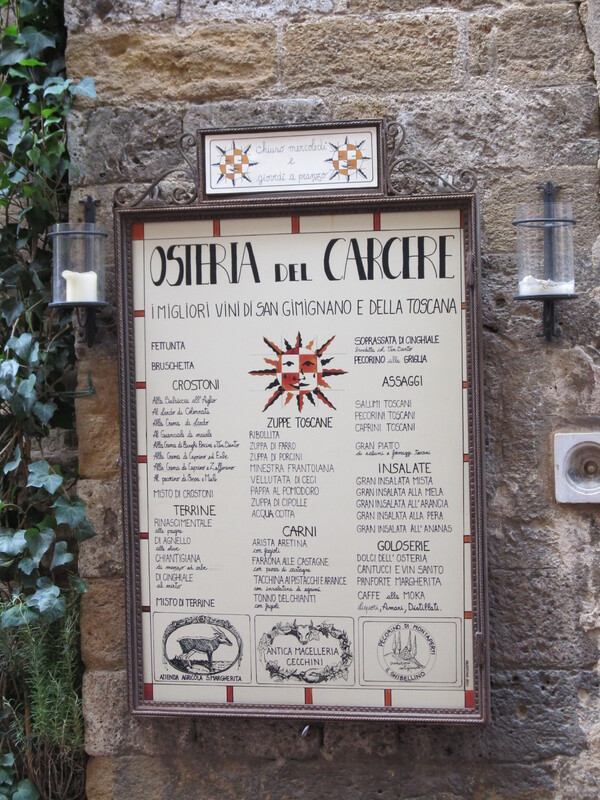 A few weeks ago, on our last day in San Gimignano, we ate lunch at a small place just off the main piazza called Osteria del Carcere. Despite being just down the street from where all the tourists congregate and queue up for gelato (there’s an award-winning gelateria in San Gimignano) the osteria seemed rather un-touristy. Just our kind of place. As the two of us sat there ooh-ing and ahh-ing over our zuppe (Cheryl had a really garlicky ribollita which she wasn’t sharing much of) I had already decided the vellutata de ceci I had ordered would be the first thing I’d try to recreate when we got home. It isn’t a very complex soup to make but it has, in my opinion, a lot of depth to it. In fact, I thought the soup was pretty much just pureed chick peas with a very earthy mushroom-y flavor in the background. Some pieces of bread and olive oil drizzled on top and that was it. Simple Tuscan flavors. As I pureed and added all of the mushroom broth I had made, the soup remained thick. Even worse, it was a bit on the grainy side. I thought maybe I didn’t fully cook the chick peas and make them soft enough. Maybe I even used too many, 1 lb of chick peas makes for a very thick soup! After running it through a wire strainer (oh how I wish I had a chinois) and pureeing again with even more of the reserved cooking water the soup became much smoother. Still a little on the starchy side but much smoother. Perhaps a little more liquid will give it the velvety smoothness which is just missing. Maybe even add some cream to it, but I feel like that would be cheating. So how close did I come based on memory? Close. Not a perfect match, especially texture-wise, but I think I totally nailed the flavor. Cheryl said she thinks it is very close too, with the exception of the original being maybe a little thinner, and more velvety. But, for the record, she didn’t leave any behind in the bowl so I’d say it was successful. 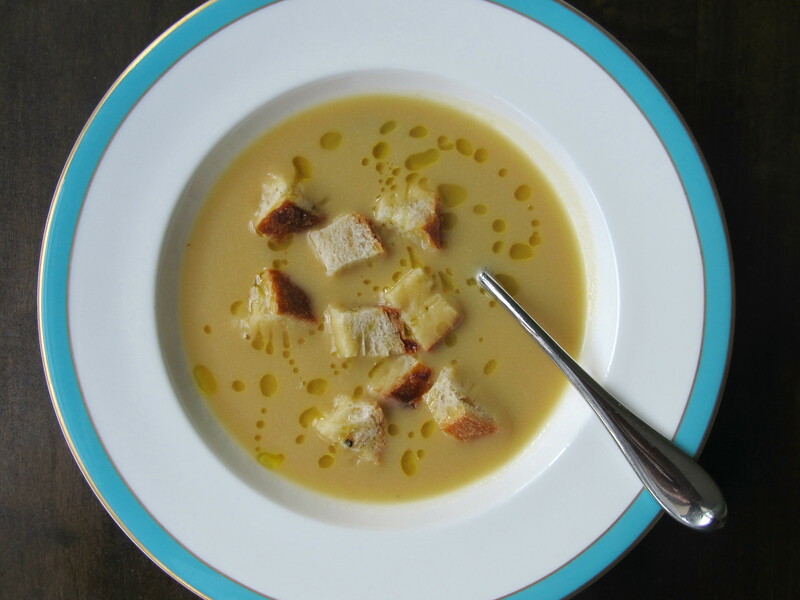 Make sure you use a really good quality olive oil to drizzle on top of the soup. You know, that fancy and really expensive one you only use on special occasions. It makes all the difference! Quick soak the chick peas. Place the chick peas in a large pot and cover with 6 C of water. Bring to a rapid boil over medium-high heat and boil for 2 minutes. Turn off burner, cover pot, and allow to sit for an hour. Drain chick peas, reserving liquid. You should have around 4 C of the chick pea water. Put chick peas back into the large pot and cover with water by an inch or two. Bring to boil, reduce heat to simmer and cook chick peas until soft and tender. This may take a couple of hours and you will have to add more water during the process, probably a couple of times. Just make sure they’re soft! In the meantime…. Take the reserved liquid, pour into a saucepan, and bring to a boil on the stove. Turn off the burner and add the dried mushrooms. Steep for 30 minutes. Strain mushrooms out of liquid, squeeze the water out of the mushrooms, reserve liquid. When the chick peas are cooked and softened, drain them, reserving some of the liquid. Place the cooked chick peas into the pot, pour in the mushroom-chick pea broth and blend/puree with your sick blender (or use a food processor or food mill if you have one). It’s still going to be pretty thick so add some of the second batch of reserved chick pea water one cup at a time and blend in to your desired consistency. Not too thick but not too thin. Season with salt and pepper to taste. Heat up, add cubes of a crusty country loaf of bread (or whatever stale bread you may have lying about) and drizzle olive oil on top. Very nice Zuppe, sounds like trial and error but you got it pretty close. Chick peas can be grainy especially when dried are used, the older they are the harder they are to cook I think, at least thats what I have heard. It really does sound delicious. Yup, the taste was there and it was still delicious despite the minor texture issue. What is a sick blender?